1. 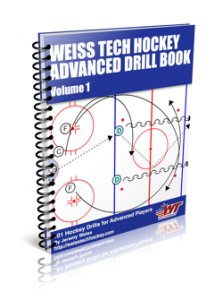 Forward starts at blue line, builds speed, picks up puck at far blue line and carries it into the zone with speed. Can also start at far end if using the whole deck. 2. Defense converge to stop the puck carrier. 3. 1st defender (player closet to puckcarrier) stops the forward (plays the man) and tries to force him into the HELP D while tying him up. 4. 2nd defender (HELP D) prevents F escape and steals the puck. 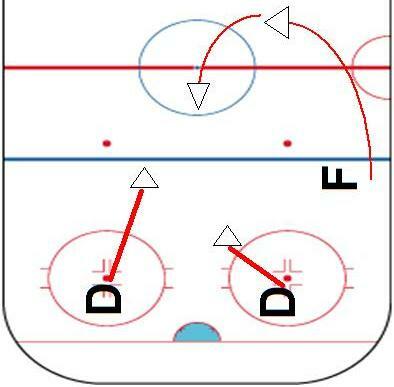 -D need to focus on slowing down the F.
-D should focus on the F logo, not the stick/puck. -1st defender job is to slow the man down and force him into HELP D.
-2nd defender cannot let the F escape w/the puck.